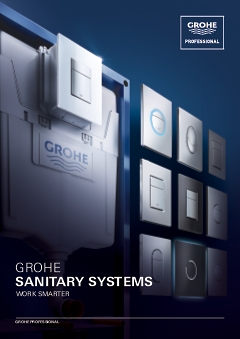 This GROHE Skate Air Cosmopolitan flush plate is made with titanium and stands out in your bathroom, despite its modest dimensions. This flush plate fits perfectly with GROHE taps from the various Cosmopolitan tap series. Thanks to EasyConnect, you can easily mount the plate both horizontally or vertically and the Dual flush- and the Start-Stop function ensure easy operation. With the Dual flush, you can use a small or big amount of water when flushing and that saves both water and money. Very useful anti-fingerprint technology ensures that fingerprints don't become visible. That saves time when cleaning!